What better way to keep the kids happy, entertained and outside? (Large Bounce sizes just $30.00 more). That's almost three days to enjoy it! We know many of our customers do not celebrate Christmas; but when the kids are home and bored this is a great way to enjoy the long weekend. Delivery charges apply. This offer valid on regular size bounce houses. 12/24/14-12/26/14 only. Reserve any Standard Bounce House and tell us on the comment line that you want the Christmas Special and we'll add the discount. Browse our website for other great ideas to entertain family and friends this holiday weekend. This is a great time of the year for "Reindeer" Pony Rides or a Petting Zoo too. 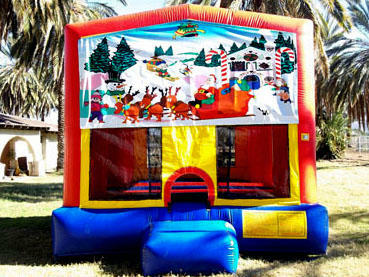 We also have larger Inflatable Games and Slides, Carnival Rides, Rock Climbing Wall and Mechanical Bull. Santa likes to stop by and visit good little boys and girls. Ask us to arrange it for your special ones. We also offer Mrs. Claus, Elf Balloonists & Elf Face Painters. How about a renting a large Inflatable Outdoor Movie Screen to watch your Holiday favorites? *On Sale Now Just $195 all day! Hook up your Playstation, X-Box or Wii for great family fun! Call us at 480-820-8030 for details. Bounce House Rentals in Phoenix, Phx, Scottsdale, Mesa, Tempe, Chandler, Gilbert, Queen Creek, Apache Junction, Peoria, Glendale, Surprise, Laveen, Avondale, Prescott, Flagstaff, Payson, Showlow, Pinetop, Buckeye, Goodyear, Litchfield Park, Maricopa, Fountain Hills, Casa Grande, Florence, Coolidge, Anthem, Cave Creek, Carefree, Paradise Valley, Globe, Marana, Eloy, Gila Bend, Wickenburg, Tucson, Tolleson, Pima County.